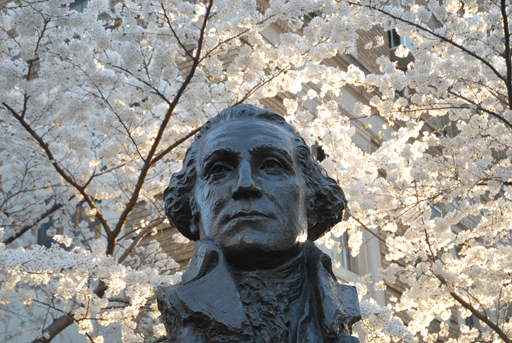 One of the five busts of George Washington on campus. "Deeds Not Words." This simple credo of President George Washington is carried forward to this day by the actions of members of the GW community. The GW community is a diverse, talented group. Parents, students, families, faculty, and staff all contribute knowledge, time, and money to furthering the GW student experience. Thank you for your investment of time and expertise that lends support to GW students and faculty. If you have any questions or ideas about how to get involved, please contact us at [email protected]. Use your knowledge to give students the skills for future success. How did your GW experience bring you to where you are today? Tell us about your success, and help us tell our story on social media. Volunteer leaders bring their knowledge to bear in promoting initiatives and leading long term strategy as a part of GW advisory councils and boards. Family philanthropy plays a crucial role in building an exemplary educational experience for GW students. Through internships, career advice, and financial contributions, families support all aspects of student life. Faculty and staff contribute vital time and talent every day to realizing GW's goals. The We Are GW campaign serves as another way to invest in GW students. GW donor societies recognize and celebrate the impact that giving at all levels has on our students and faculty.